Protestors during rally at Jammu on Tuesday. JAMMU, Sept 11: Youth All India Kashmiri Samaj (YAIKS) took out protest scooter rally, which started from Janipur and after passing through various areas culminated outside Governor House here. 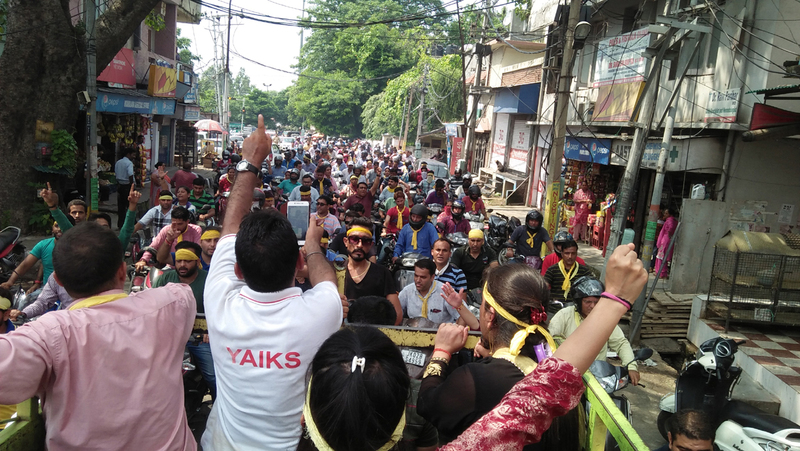 The rally was taken out under the leadership of YAIKS President RK Bhat. While addressing the gathering, Bhat said that PM’s rehabilitation package for Kashmiri Pandits is a big failure and was a cruel joke with the community. He demanded restructured, re-looked and revised PM’s rehabilitation package after having proper dialogue with the YAIKS and its representatives. He appealed to the Governor to get sanctioned the next more 3000 jobs in additional to already sanctioned 6000 jobs for left over candidates. 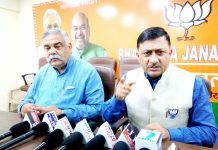 He also urged the Governor to direct SSRB and Relief Organization not to reserve SC, ST, ALC and OSC posts unnecessarily as such categories are not available for Kashmiri migrants. He also demanded 5 per cent reservation of employment in Central and State Governments for Kashmiri migrants. “More than 25000 KP migrant employees retired from State and Central Government departments during the period of migration, bit unfortunately none of the vacancies got filled among community members. It was agreed upon in the package that whosoever is ready and volunteer to go back to Kashmir Valley will be provided survival in terms of suitable jobs as per candidate’s eligibility. A large number of Kashmiri migrant youth applied for the different posts as per their qualification, but most of the candidates were dropped for unknown reasons despite being qualified as in light of the notification issued by the concerned authorities”, Bhat informed. On behalf of YAIKS, Bhat served ultimatum to the Government to start dialogue with them and if failed, YAIKS will intensify the struggle and re-start the national wide direct action programme. Among others present were BK Bhat and Sunil Koul, Vice Presidents, Manoj Handoo, General Secretary, Ajay Safaya and Sanjay Ganjoo, Secretaries, Ravinder Sharma, DN Bhat and Bhushan Lal Dhar, Advisors, Sanjay Bhat, Kuldeep Pandita from Thinkers Forum, Ravinder Pandita from Relief Holders Forum, Rakesh Koul, President Sampooran Kashmir, etc.